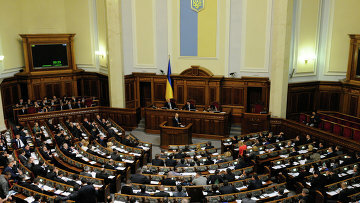 Bill on settlement of situation in Donetsk, Luhansk reaches Ukraine’s parliament | Russian Legal Information Agency (RAPSI). MOSCOW, October 4 (RAPSI) – A bill laying the groundwork for peaceful settlement of situation in the Donetsk and Luhansk regions has been submitted to the Verkhovna Rada, according to the website of Ukraine’s parliament. In 2014, residents of the Donetsk and Luhansk regions proclaimed the establishment of People’s Republics and declared sovereignty. In April 2014, Kiev started a military operation against Donbas residents who did not accept the results of the February coup. Ukrainian authorities claim the self-proclaimed republics are terrorist organizations. According to the UN, about 10,000 people have died in Ukraine since the start of the armed conflict. The both parties to the conflict “continued to ignore and violate international humanitarian law, infringe upon rights to life, freedom, safety and personal security,” the organization stated. 17:12 04/10/2017 A bill laying the groundwork for peaceful settlement of situation in the Donetsk and Luhansk regions has been submitted to the Verkhovna Rada.